Given that he lived a quiet and low-key life in Spain, Jonathan Williams was always bemused by the ability of a certain group of people to track him down. Every now and then he would receive letters from autograph hunters – usually dealers masquerading as fans – and he struggled to work out how they had found his address. There was of course one enduring reason for the interest of these folk – Jonathan drove a works Ferrari in the 1967 Mexican GP, his one and only F1 start. At the time it hardly ranked as one of his most satisfying achievements. And yet over the decades, this modest and softly spoken man came to appreciate that his single season at Maranello, and status as a Grand Prix driver, was something of which he could be proud. Jonathan passed away in Spain on August 31, aged 71, having spent most of the past 50 years outside the UK. That lifestyle choice was perhaps an unconscious reflection of the fact he was born in sunnier climes, but denied the chance to grow up there. It was no coincidence that the first song played at his funeral service was Willie Nelson’s On the Road Again. In the years before WWII, Jonathan’s father was joint headmaster of the Anglo-Egyptian School in Cairo and his mother taught English to the daughters of King Farouk. Williams Sr joined the RAF when hostilities commenced, becoming a squadron leader. He returned to Cairo when leave allowed, and Jonathan was born there in October 1942. Everything changed for the family in 1944, when the British government demanded that all its subjects left Egypt – and thus toddler Jonathan found himself on a boat to Liverpool. Jonathan’s first road car was a Frogeye Sprite, but when he began to modify it with a view to going racing his father decided that the open car might be a little too quick as a starting point. It was quickly traded for a red Mini, and in late 1960 Jonathan took his first steps in motor sport. Jonathan replaced the Mini in 1962 with a highly modified Austin A40. Single-seaters were the next step, and for ’63 he looked to Formula Junior, buying a locally produced Merlyn from Selwyn Hayward. Alas he had a huge crash in Monaco after the suspension failed. In 1964 Jonathan teamed up with Courage to tackle the new F3 category. They named themselves Anglo-Swiss Racing, and set off on a memorable trek around Europe. The following year Lucas started a team and ran them in a pair of Brabhams. The season proved to be a breakthrough, with both marking themselves as men to watch, although a huge crash at Reims – which left Jonathan with back injuries and broken legs – put him out of action for a while. For 1966 he parted company with Lucas to join de Sanctis. Always preferring the continent to Brands and Silverstone, he lived an idyllic life in Rome and dominated the wild Italian F3 scene. His form did not go unnoticed. “We went up there and Ferrari had a contract all ready for me to sign. It was F2, plus sports cars where necessary, and F1 was mentioned as an outside possibility. “Then, on the way out of the office, Ferrari said to me, ‘The next time you’re in England talk to Keith Ballisat of Shell, they’ll pay half your salary’. When I talked to Keith he tore his hair out and said, ‘We don’t have this in our budget, it’s absolutely untrue’. A week later he gave me a cheque for a thousand quid and said, ‘That’s all we can do’. 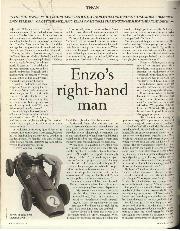 So old Enzo shafted me before I’d driven a car! He finally made his Ferrari race debut at Sebring on April 1, farmed out to Brescia Corse to share a Dino 206S with Mario Casoni. They retired early and the same happened when he drove a works car in the Monza 1000Kms. After that the F2 project was put on hold. Back in sports cars Jonathan didn’t start at Mugello after co-driver Günther Klass was killed in practice, and then at the end of July he finished sixth in the BOAC 500, sharing a P4 with Paul Hawkins. In October he was dispatched to the USA to drive a works P4 in the Can-Am series. He finished eighth on his debut at Laguna Seca. The next race was a fortnight later at Riverside, and Jonathan expected to enjoy a leisurely break with his new lady friend. 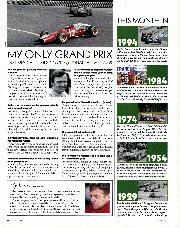 “The Ferrari guys were off to Mexico for the GP, and Franco Lini said, ‘Come with me’. I said, ‘No. I’m good here.’ He said, ‘You’re coming...’ Reluctantly I parked the Ferrari and the girl, then went to Mexico. And Lini had said, ‘Bring your Nomex rompers with you’. He eventually finished eighth: “I stayed on the road to the end, while Chris ran out of petrol. So the record shows I beat him! I was getting quicker every lap, I was learning how to do this. It was a lovely car, easy to drive. Given time I would have been quick, it had no vices. After a few days off with Amon in Acapulco, Jonathan headed back to the USA for the Riverside and Las Vegas Can-Am races, neither of which brought much joy. On his return to Europe things went quiet until Ferrari asked him to conduct an F1 test at Modena. Jonathan believed that day might have cost him an F1 race seat in 1968 – a season when the 312 was fast enough to earn Amon three poles and Jacky Ickx a GP victory. 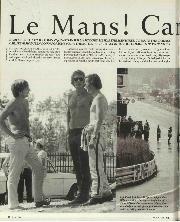 It’s worth recalling, too, that even with those guys on board Ferrari gave Derek Bell a chance. In 1968 Jonathan joined Abarth with a view to driving the company’s planned F1 car, but it never turned a wheel. He kept himself busy with a series of F2 guest appearances. For the Monza Lottery he replaced Courage – committed to the Dutch GP – in Frank Williams’s Brabham. Always an ace in slipstreamers, he scored a superb win. At the end of the year he drove a Tecno for Alejandro de Tomaso in the Temporada series, which led to some races with de Tomaso’s own F2 car in 1969. 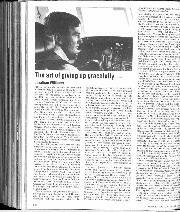 He also raced a Serenissima sports car that year, and found time to qualify as a pilot after an intensive course at a Florida flying school. 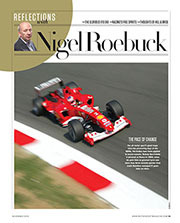 He’d been turned on to planes by former Ferrari team-mate Mike Parkes. The 1971 Targa – in which he finished seventh in a Lola T212 – was his last significant outing. His heart was simply no longer in it. By then he had already started a new career as a pilot, having gradually added to his qualifications with a commercial licence. He spent many years flying wealthy businessmen around, before eventually calling it quits. In 1997 he bought a small motorhome and lived a nomadic but satisfying life, driving around the coasts of Italy, France, Spain and Portugal, initially in company with then-girlfriend Linda, and their dog Zack. He made friends with people he met along the way, listened to the 1960s/70s music he loved – mostly American – and occasionally wrote articles about his past. After Jonathan and Linda split up he continued on his own, although they remained friends. Indeed, when she moved overseas Jonathan based himself at her flat, in a small seaside town between Malaga and Gibraltar, to look after the now ageing Zack. This was supposed to be temporary, but Zack proved to be resilient and, after a while, Jonathan reluctantly sold the motorhome. He was heartbroken when the much-loved mutt died earlier this year but, facing health issues of his own, he postponed his plan to buy another camper and resume his travels. In the end, sadly, he ran out of time.